We got about eight inches of snow overnight and it was still coming down when I left for work this morning. 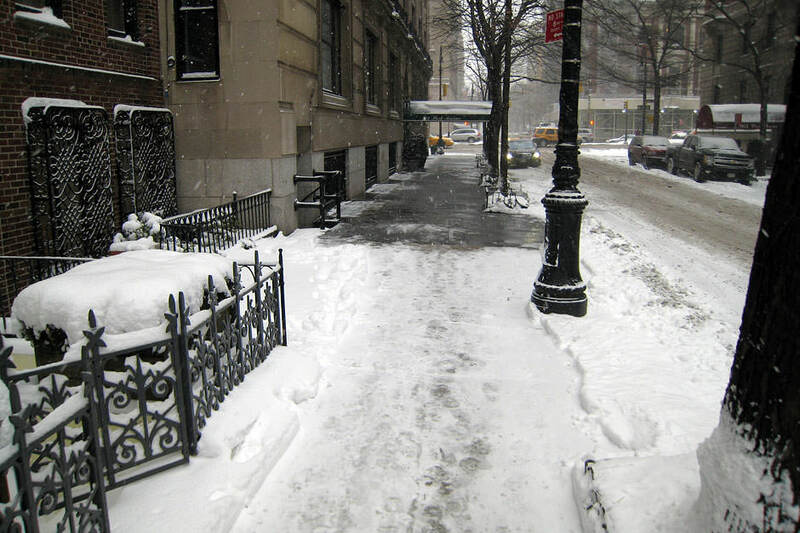 When a large snowfall occurs, I usually alter my route to work to take advantage of cleaner sidewalks, but something about Park Avenue has always bugged me. 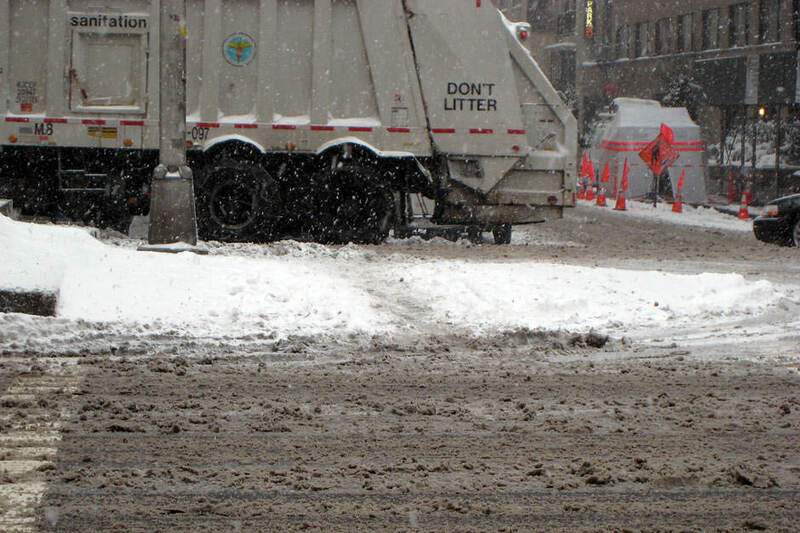 Here in NYC, all buildings are responsible for clearing the snow from their sidewalk when it snows. The larger the apartment building is, and the more well off the residents are, the better the snow removal is. For example, a small 4-story walk-up building with 12 apartments is going to wait until the superintendent gets around to it, while a large block-long condo building is going to have their 24-hour maintenance staff shovel once an hour with an electric shovel. This is why on days like today, I head to Park Avenue as quickly as possible to walk on their clean, and wide, sidewalks. There’s only one small issue with that plan. Take a look at the sidewalk in the above picture. You can clearly see where the Park Avenue building’s sidewalk ends, and the other building’s begins. This is not the problem. The below photo is. Park Avenue has both uptown and downtown traffic, and the two traffic directions are separated by a median that houses little green areas with grass, trees, and flowers. At the tips of the median at each intersecting street is a little rounded portion of sidewalk that people can walk on (it also serves to indicate to drivers where they shouldn’t drive). Apparently, no one takes responsibility to clear the snow off this little “island” when it snows. On a morning like this, when snow is still falling, it really isn’t an issue. However, once the snow stops, and the path gets trampled on even more, it becomes nothing but compacted ice, which can be very slippery. 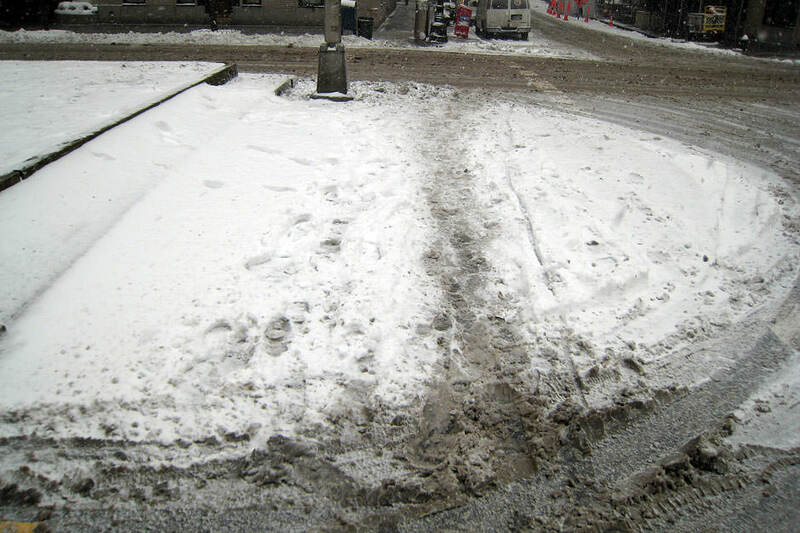 While yours truly hasn’t slipped on it (yet), it is easily the most hazardous part of my daily commute.